The Macallen Building launched in Summer of 2007. Designed by Office dA a renowned Boston-based architecture and urban design firm, the building’s modern architectural design fuses with the environment and harmoniously balances indoor and outdoor space. In 2008, the U.S. Green Building Council granted the Macallen Building Gold LEED Certification; it is the first condo development in the city to reach such high standards of energy and water efficiency. Inside, you will find a spacious, well-lit living area with high ceilings and large windows. Kitchen cabinetry and fixtures are customized to make your home truly unique and elegant. High floor duplex and triplex units offer private balconies for intimate and leisurely outdoor gatherings. You can also find another easy escape to the outdoors on the enormous, 18,000 square foot rooftop plaza completed with a heated pool, beautiful green space, comfortable lounge chairs, and gas grills. Other amenities include an in-house fitness center, entertainment room, garage parking, and concierge services. 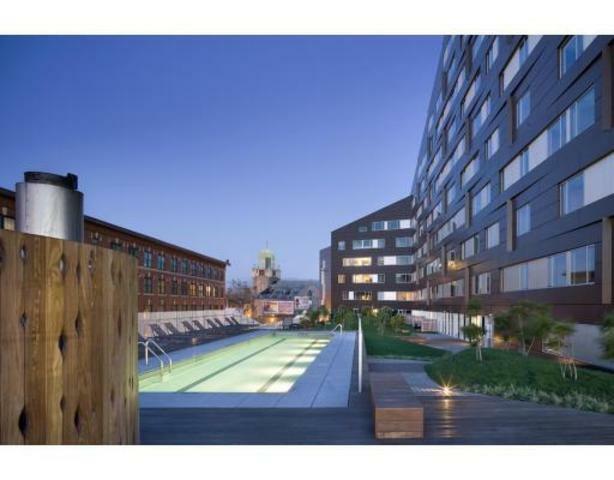 Conveniently located in South Boston, you will be able to access other points in the city easily. The building is close to the Broadway T stop on the Red Line and also within walking distance to the South End and Financial District.